I-684 is connected to the Hutchinson River Parkway via a short freeway branching off of both roads, connecting the two. The connecting road also has an exit with Manhattanville Road. 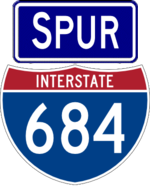 The road essentially acts as another branch of I-684. The views and opinions on this website are my own and do not represent NYSDOT or its affiliates.